The UF Addiction Medicine Fellowship program has been recognized by the ABAM Foundation as one such program that instills these attributes in their fellows. As a result of this award in excellence for training and education of addiction medicine fellows, the ABAM Foundation believes UF Addiction Medicine Fellow, Dr. Anthony O. Russell has demonstrated significant achievement and represents the future of addiction medicine. Dr. Russell has been selected as a 2015-16 Next Generation Award for Adolescent Substance Use Prevention Fellow. 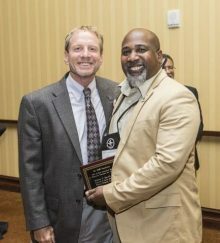 Dr. Russell was selected based upon his strong interest in health care for adolescents coupled with his desire to use his addiction medicine training to service this population and his commitment to pursuing a career that includes prevention and early intervention in the adolescent population. 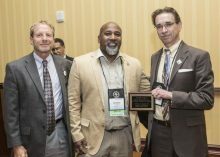 UF Fellowship Training Director, Dr. Scott Teitelbaum and Dr. Russell were presented with the Next Generation Award for Adolescent Substance Use Prevention at the American Society of Addiction Medicine (ASAM) conference in Austin, TX. This award includes a gift of $25,000 to support educational experiences for Dr. Russell’s strengths and interests regarding youth with an emphasis on prevention and early intervention for substance use. The award was presented by Dr. Richard D. Blondell, Chair of the ABAM Foundation Training & Accreditation Committee and Medical Director, ABMAF National Center for Physician Training in Addiction Medicine. Please join us in congratulating Dr. Russell on his outstanding achievement and the Faculty and Staff at the UF Addiction Medicine Fellowship Training Program for all their hard work in making UF one of the top training programs for Addiction Medicine.